How does it work? Is my business eligible? 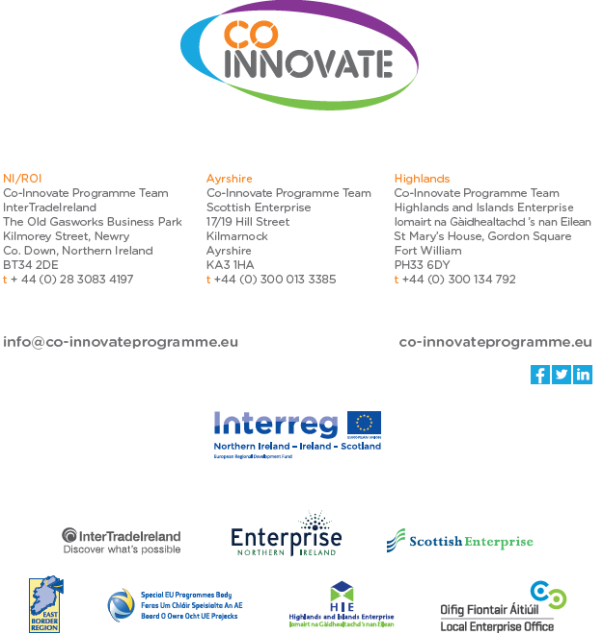 Co-Innovate will give you the tools and tailored support to help you innovate, differentiate and compete successfully. Every company’s innovation needs are different so each company’s journey through the programme is unique. The programme offers graduated levels of support including free workshops, individual business health checks, detailed innovation audits, sectoral networks, project management placements and one-to-one expert mentoring. We welcome applications for all business sectors; e.g. manufacturing and tradable services sectors, and particularly welcome applications from priority sectors such as. If you would like to find out more or register your details, please contact NDDO today!